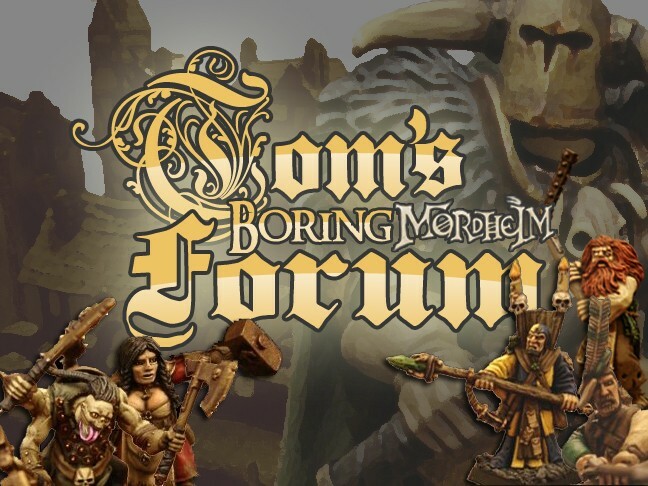 I was asked what set of rules I was using for my warband over in my Wood Elves plog (you can see that here) and thought it best to share that kind of thing in the rules section of the forum. I'm using a modified list that was originally created by Dyrnwyn over at Warseer (his original list here, the discussion thread here) with a few tweaks of my own that I felt better represented the flavour of a small Wood Elf warband. You can download a copy of my Wood Elves warband list here. This is the second campaign I'm using this list in, and one of my friends has also picked up the same list to use for his warband. The last campaign I was in, they faired quite well, a mostly losses over wins (due to routing early) but they could certainly pick a fight. Undisputedly the best ranged units in both campaigns, although the biggest problem I've found is a lack of attacking dice. Only one chance per henchman to score a hit, and two at best from heros, means you had better not roll badly! Unfortunately, that has been mostly the case with this latest campaign, as time and time again I managed to fudge the rolls. They aren't totally incapable in close combat though. The wardancer henchmen are fantastic on the charge, and can parry with any weapon, but honestly they can't take a hit. Even with an unmodifiable 6+ tattoo save, these guys almost always had a short life expectancy. Haven't had the opportunity to use the Treekin yet, don't think I will either. As a unit, I think it's totally out of place in Mordheim, or possibly even Cathay (with the BtB Campaign), and I might consider removing it from the list. The heroes of this list with inevitably make or break this warband. Rolling well on the experience charts is pretty much the only thing that will really further this warband, as they are heavily reliant on BS and various Shooting skills. So far, in this current BtB campaign, I've got a T4 Waywarden and Spellsinger, which while I can't really knock having tougher elves, having more BS or a skill upgrade would benefit the list far more. The Waywarden is a very Jack-of-all-Trades character, with great potential in either ranged or close combat. I've found focusing on one or the other works best, but more playtesting might be required. The Wild Hunter is geared more towards close combat, although is still a very capable ranged unit. I've tried giving him Strongman and a massive two-handed sword last campaign, which did work, but his attacks were too limited for what he should have been capable of. A better strategy is to go for two one-handed weapons and something like Mighty Blow. The Pathfinder can be a great character, with potential for massive bonuses to shooting and almost unhitable at range, with the right skills of course. In my last campaign, any warrior attempting to shoot at him would suffer a -4 to hit. He was amazing. But I feel like I got lucky, with plenty of skills rolled on the experience chart and few attribute increases. The warband as a whole kind of fits into both the Mordheim campaign and Border Town Burning campaign, but barely. Mordheim is close enough to Athel Loren that they might consider the spread/distribution of new wyrdstone a threat, and as such would send a warband out to remove them from potential abusers. The rising of a Chaos Daemon Prince or the rampaging of a Beastmen herd through the Cathayan Borderlands might be enough for a particularly zealous Waywarden to leave the protection of the forests. Regardless of whether you think they should be there or not, I like elves. And I didn't want to play the [sarcasm] only mildly broken [/sarcasm] Dark Elves or Shadow Elves list. Comments and criticisms welcome! If you have an idea for a rules change, do let me know! I like so much this warband. I think that would be awesome in a Empire in Flames campaing, but my only criticism would change the elves racial limit for Toughness, 3 instead of 4, but for all Elves (High Elves, Druchii, etc...).